… We could go on, but these factors seemingly haven’t deterred a new set of buyers who, presumably spurred on by our American cousins, have decided that the pick-up truck makes the perfect lifestyle statement. Even if the daily routine doesn’t involve hauling over a tonne of stuff, tackling the local quarry or traversing a quagmire of a building site, there are customers who want the peace of mind afforded by a ridiculously raised ride height and the beefed-up styling. Both Nissan and Volkswagen have rapidly cottoned on to this fact and the former recently updated its Navara model, replacing its vintage leaf springs with a new multi-point suspension set-up and ‘SUV-like’ interior. 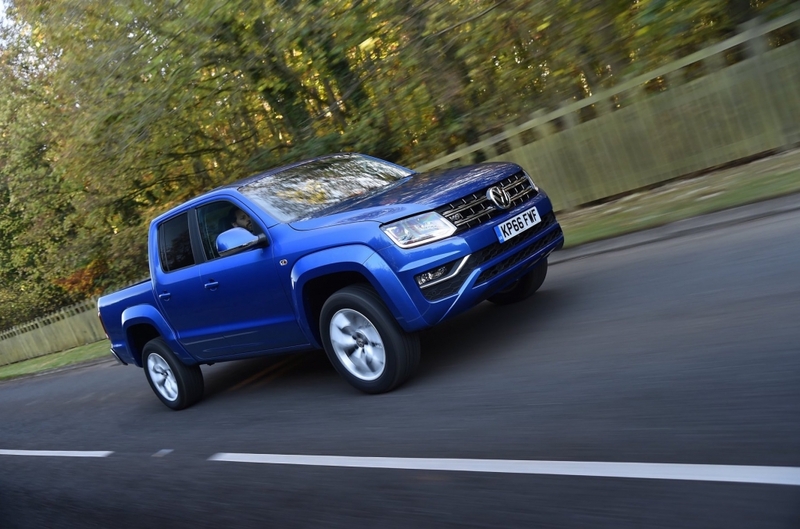 The result is a pick-up that’s much easier to live with every day but before you rush off to your local Nissan dealership, you might want to check out the latest Amarok. 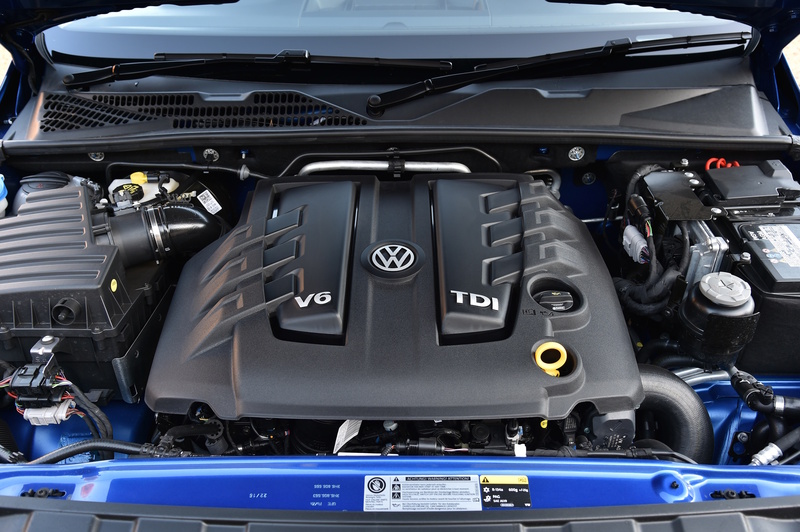 It comes with a new 3.0-litre V6 turbodiesel engine (emissions scandal, what emissions scandal? 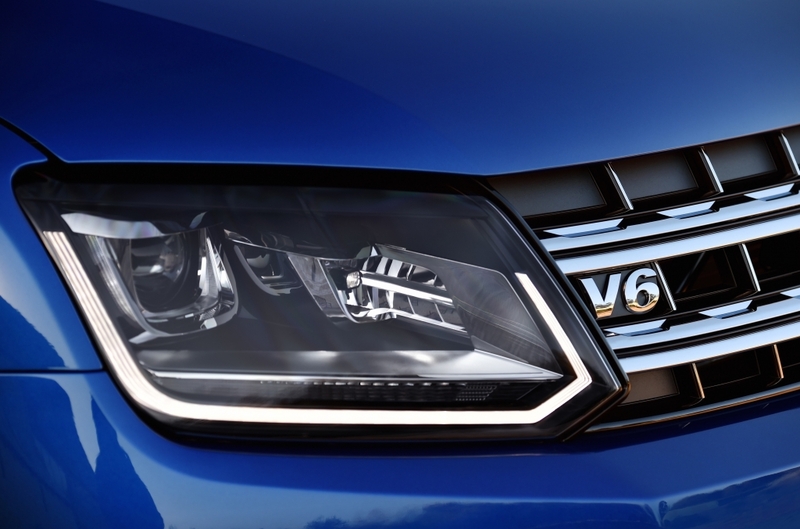 ), a sleek new interior, the latest VW infotainment system and sharp exterior styling. Imposing doesn’t really do this thing justice. It’s an absolute brute and when parked up on a driveway in its smart Aventura trim, complete with massive alloys, there’s something weirdly alluring about it. The monstrous V6 develops 224hp and a staggering 550Nm of torque, which means progress is surprisingly swift given that this thing weighs over 3-tonnes and marks it out as the most powerful pick-up on sale in the UK right now. 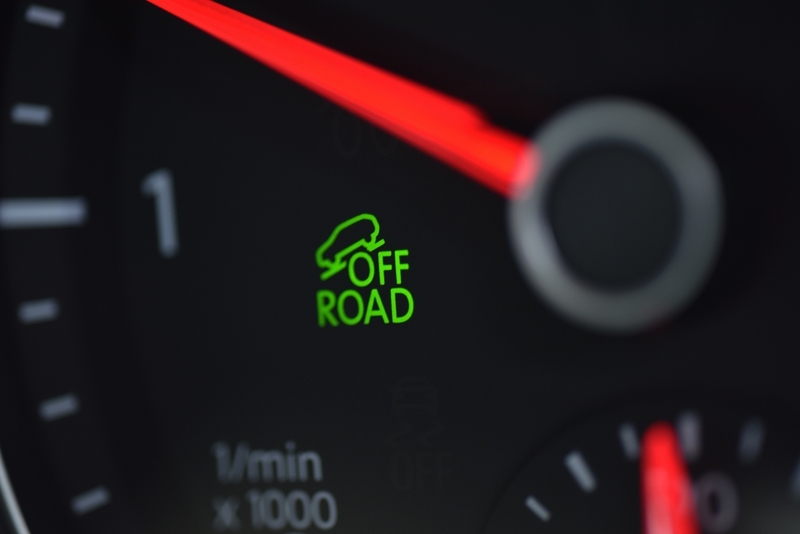 In fact, nail the throttle on a typically slippery January morning and the rear wheels will spin up before the traction control system has chance to work out what’s going on and offer assistance. Highly inadvisable but very fun. 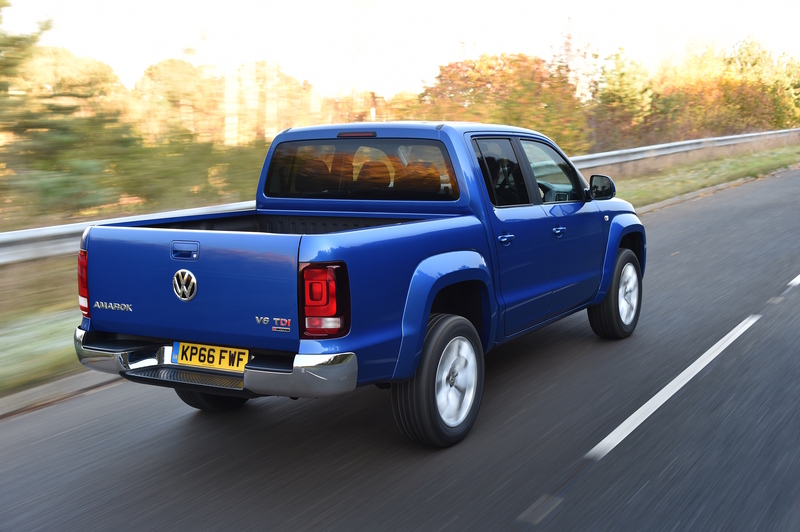 The new Amarok is currently only available in double-cab body style, which means there’s plenty of space inside for five adults and further establishes just how much VW considers this a lifestyle purchase. Spend some time in the Amarok’s cabin and it very quickly starts to feel like any other vehicle in VW’s line-up. Ok, it remains utterly vast and reaching across to the passenger seat is almost impossible, but the agricultural materials and finish of yesteryear are long gone. Inside Aventura models there are stylish leather seats and the German marque’s infotainment system includes a touch-screen display with navigation, DAB radio, Bluetooth connectivity, Apple CarPlay and a various online applications. The only nod to the pick-up you typically find caked in mud on building sites is a set of rubber floor mats. But they are easily replaced if you find they ruin the classy ambience. Our week with the gentle giant involved plenty of short trips around town, as well as a 250-mile round trip from the south coast to Kent and back with a fully laden rear cab and child on-board. It never felt unwieldy to pilot, nor did it ever feel particularly awkward to park and manoeuvre (thanks to a reversing camera and parking sensors), while the V6 proved strong and fully capable of lugging the 3.5-tonne monster from 0-62mph in 8 seconds. Granted, it takes a few miles to dial into the way it handles, the poor turning circle and the increased braking distances, but it soon feels very familiar. Perhaps the biggest bugbear remains the ride and although much has been done to improve the suspension, there’s still no getting away from the fact that the springs have been designed to cope with a one-tonne payload, so it can get a little bouncy inside. Fuel economy could also be a longer-term issue and our long trips saw us return around 30mpg, which is a little short of the 36.2mpg claimed figure but not bad for a stonking V6 and a reasonable compromise for the performance on offer. Off-road prowess is also equally impressive. With a ‘one button fixes all approach’, the Amarok only requires the prod of a digit to set the traction control, hill descent control and other mud-plugging devices into action. However, the best thing about life with a pick-up is the capacious amount of load space. Just blown a month’s salary in Ikea? Simply throw it in the back. Your kid wants to take his or her bike to the park? Throw it in the back. You need to dump a block of concrete in your mother-in-law’s garden? You get the picture. It’s also surprisingly cheap to own as a company or business vehicle, with enticing Benefit in Kind tax breaks offered to those looking to upgrade their ride to a commercial vehicle. We never thought we’d say it but we might have caught the pick-up bug. We just need a bigger driveway.